Conductor Installation Services Ltd (CIS), an Acteon company that provides hammer services to install conductors and drive piles, announced that it successfully completed its second subsea piling campaign for Technip in Norway. CIS used its remotely operated Subsea Piling System, which makes it possible to drive piles as large as 36-inches in diameter, in water depths to 300 metres. In August, the piles were driven remotely to secure the subsea Boa Extension Manifold, which makes up an integral part of the Alvheim development, approximately 225 km west of Stavanger. The development, which transports oil to the UK Scottish Area Gas Evacuation System, is designed to increase oil recovery by enhancing current production rates via three new subsea well step-outs at East Kameleon, Kneler A and Boa. Once rigorous testing of all equipment was completed, the CIS team mobilised with piling and pile-lifting equipment to the Alvheim field. Working from the Skandi Arctic dive support vessel in maximum water depths of 130 metres, CIS successfully drove the four 30-inch manifold piles. Although the seemingly impenetrable soil formation encountered at the Alvheim manifold site made the final five metres of each individual driving operation more difficult than a previous operation carried out on nearby Boyla field, the Subsea Piling System performed flawlessly. Each pile was successfully driven into the seabed to its respective target depth of 11.25 metres. The subsea operation was successfully completed in seven hours in half of the time originally planned. All four piles were driven with a 90kJ hydraulic hammer in just 160 minutes. The subsea piling process is carried out by an experienced CIS engineer from a control unit and monitoring system located onboard a nearby vessel. A hydraulic hammer, connected via an electronic umbilical cable to the control system, is lowered into the water and placed directly over the subsea pile. Once it is accurately positioned, the pile will be driven into the seabed by the hammer until it reaches its target depth. CIS, a member of Acteon’s Conductors, Risers and Flowlines group, provides conductor and pile installation services associated with construction projects carried out in the global oil and gas industry. These services are carried out both onshore and offshore to, for example, create foundations for new wells, platforms, bridges and jetties. 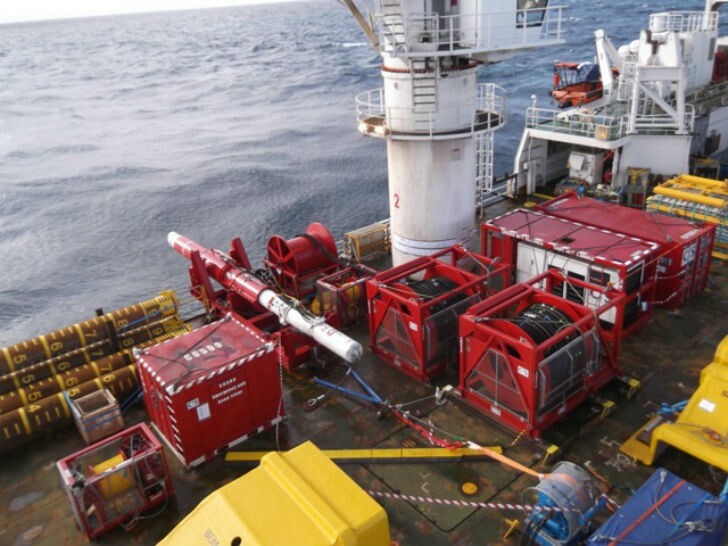 The range of services provided by CIS supports the Acteon Group’s commitment to defining subsea services across a range of interconnected disciplines. Technip Alvheim - back deck with manifold. Technip Alvheim - Deck Layout close-up. The Technip Skandi Arctic dive support vessel.